The clutch plate is located between the engine and the gearbox and allows for the distribution of power created by the engine. When the clutch pedal is pushed in it is as if the transmission is in neutral, allowing the engine to spin, but no power will be sent to the wheels. Once the clutch pedal is released and the car is put in gear power can be transmitted from the engine, through the transmission and eventually to the wheels. The clutch needs to be pressed to change gears in a manual transmission vehicle in order to control the engine speed and the amount of power produced. If your clutch goes bad you may not be able to change gears, or get into gear at all. If you notice any of these signs of clutch failure be sure to head to the auto repair shop to get it repaired! A clutch pedal that becomes difficult to press or if it seems to rest closer to the floor there is likely a problem with the hydraulic linkage within the clutch system. Many times the linkage will only need an adjustment to restore the clutch pedal's factory feel, but if a leak of the hydraulic fluid is found it will likely need to be replaced. Leaking hydraulic linkage will cause a loss of pressure in the clutch pedal. 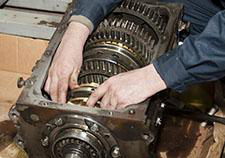 If your car's transmission seems to fall out of gear, sliding into neutral for seemingly no reason there is a good chance the clutch plate has worn down and needs replacement. Unfortunately this issue may also be caused by an oil leak that is dripping onto the clutch plate. This results in excess lubrication on the clutch that will cause the gears to slip. Do you remember when you were first learning how to drive a standard transmission? For many people there is a distinct smell that went hand in hand with these lessons. The smell of a burning clutch often reminds people of burning paper, and if this smell becomes apparent long after your years of riding the clutch to get moving have past it may indicate the need for a clutch plate replacement. You may encounter this trouble prematurely if you spend your daily commute in bumper to bumper traffic! It is important to take care of clutch problems right away in order to prevent additional transmission issues. For expert clutch repair in Sacramento you will want to visit the team at Freeport Automotive. We will perform expert auto repair to ensure your vehicle is running as best it can! Give us a call at (916) 389-2405 to learn more about our shop or to schedule superior auto repair in Sacramento.